If a person freezes on a high element it is normally possible to talk him through. Communication is the key; positive, reassuring; comments and empathy are essential. On a bottom top rope element a person always has the option of stopping and coming down wherever he is. On a ropes course a participant is obviously less able to return to the ground immediately. Therefore the use of progressions is of paramount importance. Our course is designed specifically with this in mind. On a ropes course it is possible for people to freeze and need to be rescued but if managed correctly this should happen very rarely. This situation usually arises when a person has been pushed, or pushed himself too far outside his comfort zone at that time. It is extremely important to minimise the amount of waiting on a ropes course. If a person is nervous his internal dialogue will be very loud and start to focus on his fears and concerns. If a period of waiting is inevitable then it is important that the buddies maintain communication. 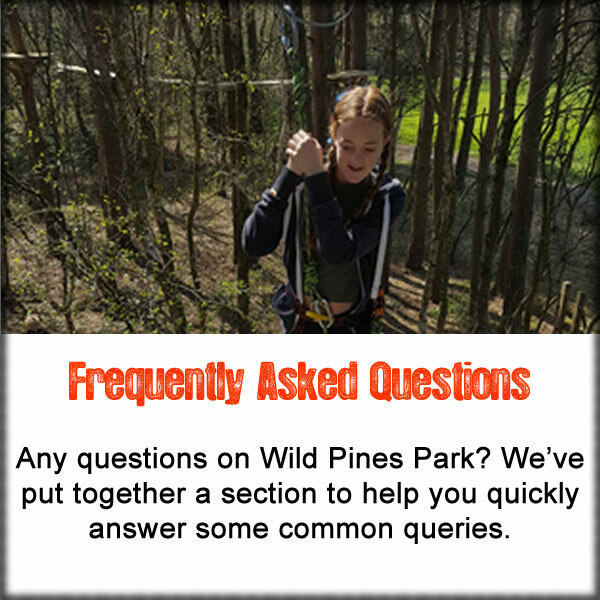 Some of the techniques that are used by Wild Pines Park to assist people when they are scared or frightened are listed below. l. Trust plays an important role - trust in the equipment, trust in the person belaying and trust in the group not to laugh or ridicule in a potentially embarrassing situation. The use of correct progressions helps build trust within the group, but it will obviously take some people longer than others, and some may never be ready to overcome their fear. Trust needs to be consistently emphasized, nurtured, and protected. Suggesting to the group that you want them - need them - to trust one another. Giving positive feedback, when someone goes out of their way to help someone from getting hurt or devalued. 2. Empathy, putting oneself in the other person's shoes is an essential skill on a ropes course. If you are able to imagine how it feels to be scared and frightened you will be in a far better position to offer support, advice and encouragement. 3. Listening and verbal support. Talking note of individuals' verbal and non-verbal responses when he is frightened is an essential skill if you are to manage the situation effectively. As a person becomes more frightened he will start to talk less and the voice will usually become quieter. 4. Suggesting all participants breathe deeper when they are anxious. Deep breathing is a useful way of bringing the body to a more relaxed slate. It helps counteract the effects of adrenaline.